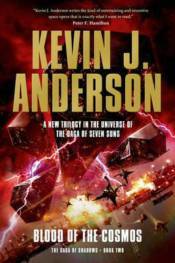 The second book in Kevin J. Anderson's Saga of Shadows trilogy. As the second book of the trilogy opens, the humans and Ildirans having narrowly escaped annihilation at the hands of the Shana Rei and their robot allies in Book One, are desperate to find a way to combat the black cloud of antimatter of the Shana Rei. The mysterious, alien Gardeners, who had helped them previously turn out to be a disaster in disguise and because of them, the world tree forests are again in danger. This opens up a second front in this galactic war. Believing they have found a way to stop their dreaded enemies, a new weapon is tested, but it's a horrible failure, throwing the human race and its allies to the brink of extinction.